Browse > Home / Horseback Riding / Let's Canter! After you feel comfortable controlling your horse in a walk, and learning to post while trotting your horse, the next step is to learn how to canter. The canter is a 3-beat riding movement of a horse that is faster than a trot but slower than a gallop. It’s a very natural gait where the first beat you hear is either the left or right hind leg. The second beat is the opposite hind leg and its opposite fore leg together, and the final beat is the fore leg opposite the first beat. 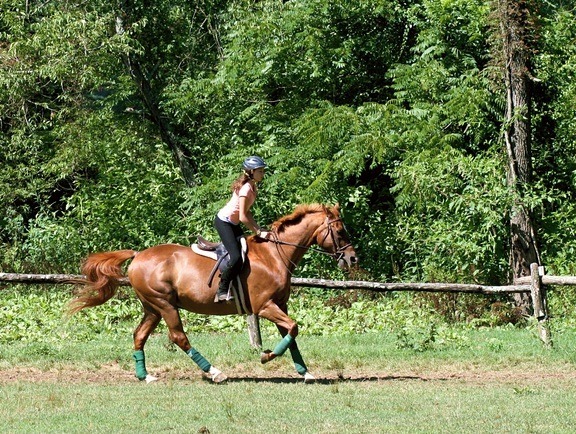 Riding the canter involves the hips moving forward and backward slightly while keeping the rider in the saddle. It’s kind of a back and forth sweeping motion rather than an up and down motion like when you post. One important tip is to not pull on the reins for balance; this makes it more difficult for your horse to more forward as he needs. There are lots of types of canter to learn as well (“working,” “collected,” and “extended” for example), but in any case its great fun to learn this technique as you develop your horse riding skills at camp. 5 Responses to "Let's Canter!" I love horses! They are amazing!I rode one in Wales!I want to do it again but, I can not afford it! that looks awesome and i have been riding on my farm 4 all my life doin musterin and things but if the person in that picture is cantering she shouldnt be rising. Cantering is my favorite gait. It’s more exiting than the boring walk, it’s smoother than a bouncy trot, and not as scary as a gallop!!!! Plus I love to jump at a canter!!! Jumping is soooo fun!!!!! And cantering!!!! at camp i learned how to ride a horse!!!! it was soooooooo much fun!!! i love riding horses and know how to canter. its so fun!!!!!!!! !